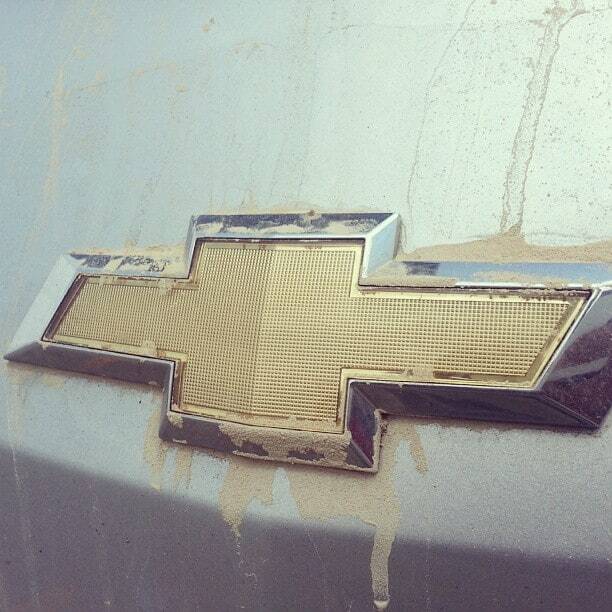 Compensation for this post was provided by Chevrolet via MSB New Media. All opinions expressed in this piece are my own. It’s Military Appreciation Month and Chevy is partnering with all of those who are Active Duty, Reserve, or Retired servicemen to offer the Chevy Military Discount. It’s their way to salute all those who have served our country in one of the military branches. #ChevySalutes is a way for Chevy to thank all Veterans young and old for the large sacrifice that they make for the safety of our citizens each and every day. 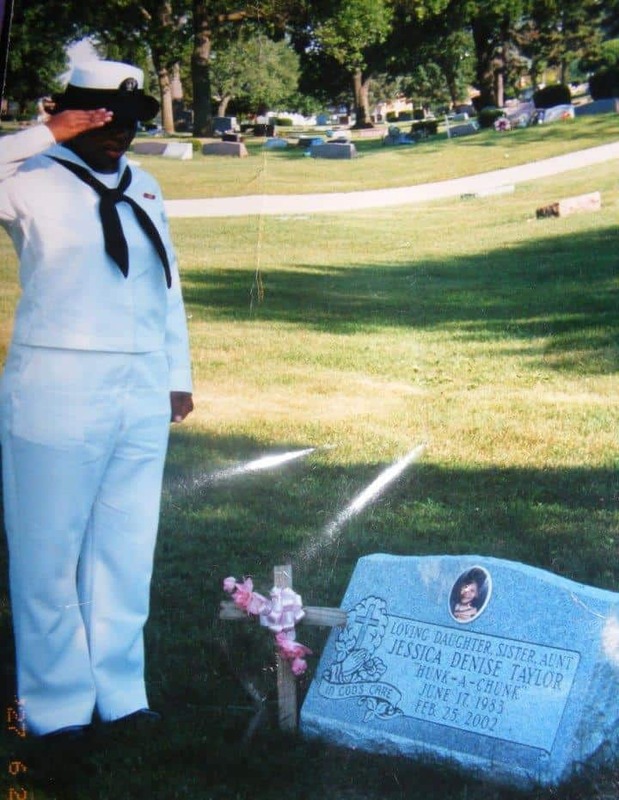 As many of you know, I served in the United States Navy for six years right after my sister died. It was one of the most difficult and fulfilling times of my life. I learned so much about myself during that time, and how much I actually enjoy having an extended family the size of the U.S. Navy. My sister served in J.R.O.T.C while she was in high school, and always knew that she wanted to be in the military. I made my decision during one intense cry session after we had long buried her. I feel that we still would have come to the same conclusion no matter how we got there. Wearing my “Popeye” uniform, as my children called it, gave me a great sense of pride, each and every time I put it on. There was a pride that came in knowing that in some way, shape or form, I was doing my job to keep our country safe. I may not have been an Rear Admiral, but I was an integral part of a well oiled machine. Mr. Houseful in this case was the military spouse. He would have been the one to stay home while I was deployed. He would have had to deal with school schedules, and dinner plans, and making sure that the cellist made it to his dental and doctors appointments. The toll that military life takes on family can be large, but the families that do it, do it with pride, with honor, courage and commitment. We became a Chevy family in 2012. 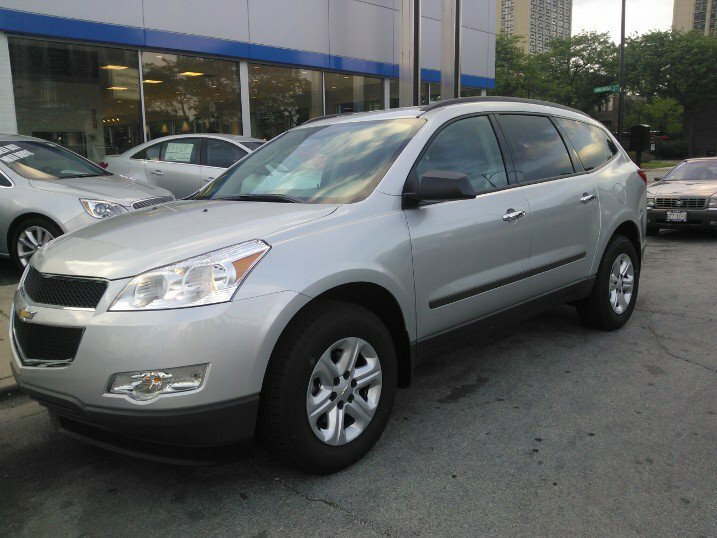 We purchased a brand new Chevy Traverse, and we love that car like it’s our own. I’m a bit sad, that I won’t be driving it up to weekend drills at Great Lakes Naval Base. Our Chevy has carried us to Missouri, Kentucky, Tennessee, Oklahoma, Mississippi, and more. It has been a great vehicle and I’m such a proud owner. There is something to be said about a quality auto maker being as supportive of the military as Chevy is. The fact that they support veterans year round through projects like Achilles Freedom Team of Wounded Veterans and Cell Phones for Soldiers means that they go far beyond only recognizing us during Military Appreciation Month. Are you worried about all of the paperwork that will be needed to claim the discount? Don’t be! You can check out ChevySalutes.com to sign up right on their web page and go into the dealership! It’s that easy! 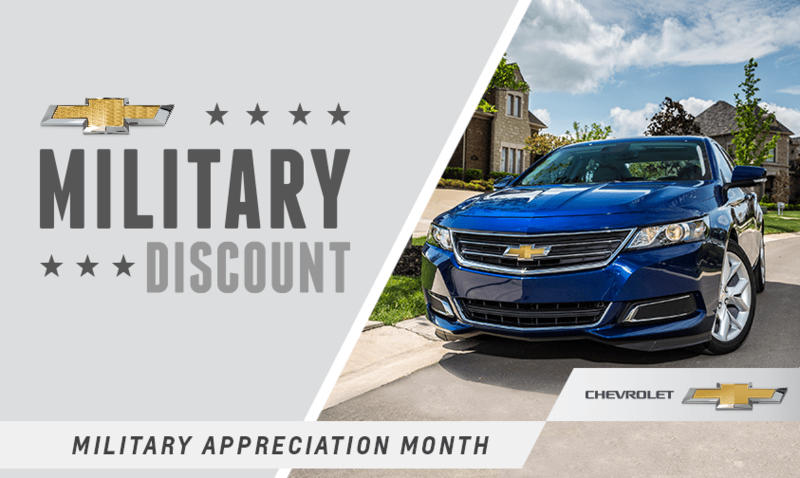 During Military Appreciation Month, now all Veterans along with Active Duty, Reserves and Retirees are eligible for the Chevrolet Military Discount. The best Military Purchase Program in the industry. The discount can be combined with most current incentives. You’ll also get the security of Chevrolet Complete Care available on 2014 purchased and leased vehicles. Backed by 24 months or 24,000 miles of included scheduled maintenance†, warranties that cover powertrain, bumper-to-bumper and anti-corrosion, and five years or 100,000 miles of roadside assistance with courtesy transportation†. USAA members receive an additional $750 private offer†. The Chevrolet Military Purchase Program is available to more military personnel than any other brand. It’s just one of the many ways that Chevrolet is proud to serve all that have served. Build and price to see how much you can save. All of you awesome readers can do a part to celebrate the Military personnel in their lives as well. 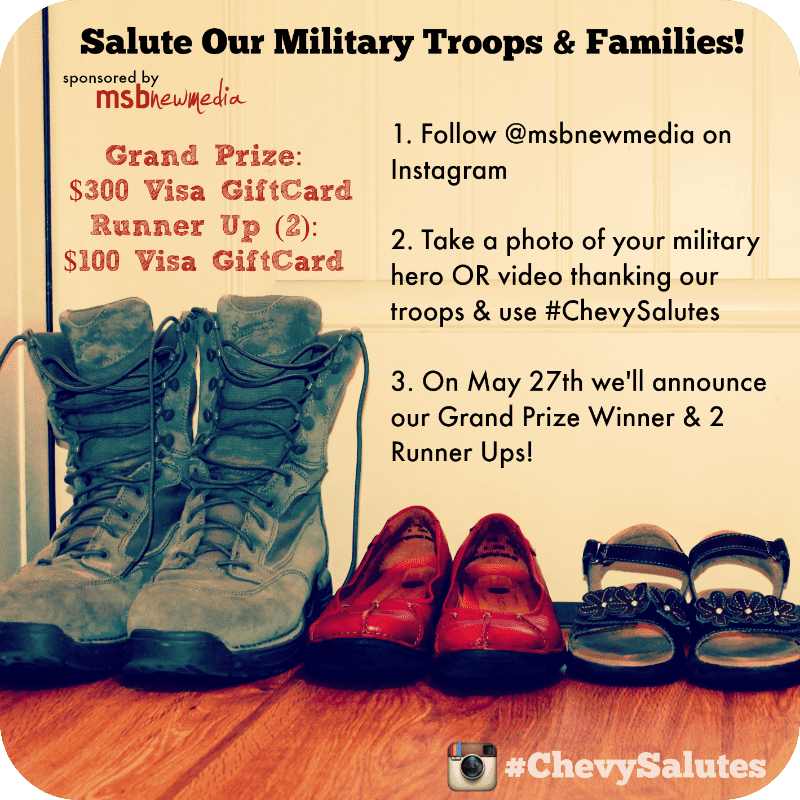 If you have an instagram account, you can thank a military member and enter to win an awesome prize! Macy’s & B. Michael Rock Out! You are incredibly beautiful, and thank you for your service. Chevrolet is doing a great thing for our military personnel. Chevy Celebrates Military sounds like an awesome campaign! It is always a good idea to keep our men and women in uniform in our thoughts in prayers no matter what stage they are in their careers. Thanks for the post! Connie Burke liked this on Facebook. Allie Ferriera liked this on Facebook. Samantha Vales Schultz liked this on Facebook.